Food is one of the most ancient media of human cultural exchange. From the Last Supper to the dinner date, food is a sign of community. We show religious devotion by fasting; we mark our celebrations with feasting. Food is more than fuel; it’s one of the tools we use to construct our culture. Unfortunately, you can break someone’s arm with a hammer just as easily as you can pound in a nail. For an eating disordered person, food isn’t nourishing. It’s destructive. Several different kinds of eating disorders have been officially recognized. 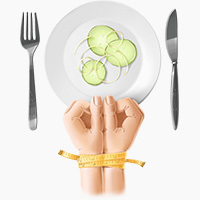 Anorexia is pathological form of calorie restriction that can leave the patient emaciated and malnourished, and often with permanent medical problems. Binge eating disorder is the opposite: a compulsive form of eating far beyond the demands of hunger or nutrition. Bulimia is characterized by cycles of binging followed by purging by inducing vomiting or overdosing on laxatives. Orthorexia can appear similar to anorexia, but instead of a compulsive focus on calories, orthorexia involves a self-destructive preoccupation with eating the “right” foods. These officially diagnosed forms of eating disorders don’t come close to covering all varieties of disordered eating patterns and unhealthy relationships with food. As generations of feminist scholars have pointed out, mainstream American food culture is one big eating disorder. The aggressively intrusive marketing and constant availability of hyper-palatable junk food collide with the ideal of thinness as not only a standard of beauty, but a sign of self-control and moral virtue. Women in particular are set up to be always wanting, yet always struggling to resist: just watch the yogurt commercials. Instead of a tool for building human relationships and sustaining a community, food becomes a tool for maintaining social pathologies and unhealthy power structures. But what does this have to do with Paleo? Sure, standard American food culture is disordered – that’s why we refuse to be part of it. We don’t demonize fat; we revel in it! We focus on eating whole, nourishing foods, and actually discourage calorie counting. Skinny might be the mainstream idea of beauty, but Paleo idealizes Crossfit babes. 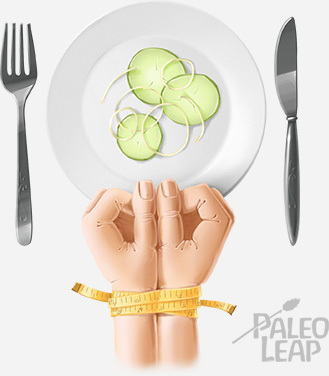 Shouldn’t Paleo be the solution to eating disorders? Unfortunately, the picture isn’t nearly so rosy. Paleo interacts with eating disorders in two ways. First, the diet itself can trigger orthorexia by feeding an unhealthy obsession with eating the “right” food. A great strength of Paleo is the focus on eating an optimal diet as determined by scientific evidence, rather than convenience, cheapness, or common knowledge. But with this kind of food analysis, more is frequently not better. The scientific approach to food can sometimes spiral out of control into an obsession with micronutrients and measurements all out of proportion to the actual health benefits: is my ratio of omega-3s to omega-6s optimal to the third decimal place? Exactly how many grams is a “medium” avocado, and is that with or without the skin? Especially on an extremely strict version of Paleo like the Whole30, it’s all too easy for the diet to consume your life to the point where your dedication to “health” is doing more harm than good. One of the biggest challenges with orthorexia is determining the point where a commitment to eating healthy becomes compulsive and disordered. Toughing out the occasional ice cream craving doesn’t make you orthorexic. And self-assessments like this one are worse than useless: planning food for the next day is perfectly normal. The line is hard to draw. Eating disorders are too complicated to diagnose with a series of tick boxes, but the questions below can give you an idea of the type of self-reflection to begin with: answering “yes” to more than one or two of them should give you cause for serious concern. When you break your own food rules, do you feel like you’ve failed as a person? Are you nervous about eating something anyone else has cooked, even if the person tells you the ingredients? Do you frequently get frustrated because nutrition information isn’t precise enough? Do you feel fear or hatred for certain foods (not the people or the advertisers or the culture surrounding the foods, but the foods themselves)? Do you ever lose sleep worrying over something you ate or are considering eating? Do you consistently feel that you have to keep making your diet stricter and stricter? The food you eat is not a measurement of your value as a human being: if your self-worth is based on the compulsive need to control every milligram of food in your “perfect” diet, you have a problem. Paleo in itself can thus trigger an obsession with optimizing your diet, which can spiral into full-blown orthorexia. But Paleo doesn’t exist in isolation: a more powerful force driving eating disordered behavior is the toxic food culture of the modern world. Most people discover Paleo as adults, after years of absorbing disordered attitudes towards food from mainstream culture. And even though you might eat Paleo, you still have to live in a world that doesn’t, where you absorb all kinds of messages about food, bodies, and emotions from your surroundings no matter how “immune” to advertisements you might think you are. That emotional damage doesn’t magically disappear with the first bite of grass-fed beef. You can binge on nuts just as easily as you can binge on chocolate cake – changing the specific foods you eat won’t get rid of the psychological roots of an eating disorder. And culturally disordered eating patterns can be especially exhausting on Paleo, because the struggle to eat Paleo in a hostile food culture is itself emotionally taxing. The sudden restriction of so many foods can feel like acute deprivation: “I’m not allowed to have pizza, or beer, or bread, or ice cream, or anything I like! I hate this!” This can lead to extremes: faced with the struggle to stick to Paleo in the face of temptation, who hasn’t felt the urge to demonize junk food? Sugar is evil! It’s poison! The dramatization makes you feel virtuous for resisting, but assigning extreme moral values to food can feed right into orthorexia, because it makes everything you eat indicative of how good or evil of a person you are. Taking such an extreme and morally judgmental attitude towards “good” and “evil” foods can also exacerbate a binge eating disorder – as Geneen Roth points out, binge eating and restriction are two sides of the same coin. For a recovering anorexic, the restriction of certain food types can trigger the restriction of calories as well. It’s not Paleo itself that triggers these problems. It’s the effort of maintaining Paleo within a wider culture of disordered eating (if Krispy Kreme didn’t exist, nobody would feel deprived for not being allowed to have it). But as long as that culture stays the same, the Paleo community will still have to deal with its effects. Eating disorders (or just disordered attitudes towards food in general) are tough to live with – but they’re not impossible. If you have an eating disorder so severe that you’ve lost your period or become too underweight to participate in normal activities, if you induce vomiting and vomit blood, if you self-harm or have suicidal thoughts, or if you’re in any other extreme danger, put down the computer and call a doctor. Right now. You cannot get the help you need from a stranger on the internet. If your disordered eating patterns are less extreme, you might benefit from some or all of the following suggestions. Eating disorders vary so widely that no one piece of advice is applicable to everyone; as with most other aspects of Paleo, the only way to find out is to hold a test run with yourself and take stock of the results. First, if an arbitrary set of rules like the Whole30 is triggering you into an unhealthy relationship with food, give yourself permission to stop. It doesn’t make you a quitter; it doesn’t make you a failure. Think of it like taking a rest day from exercise. If it’s really on your bucket list to finish the program, it’ll still be there in six months. This doesn’t mean that you should abandon every effort to eat healthy and embrace a diet of McFlurries and nacho cheese. Stick to the Paleo basics, and in place of whatever set of rules you’re giving up, make a commitment to yourself: you will allow yourself to eat the real food that your body needs, without fear or shame or self-loathing. Don’t restrict your food choices further than that. Fruit is real food. Fructose isn’t a raging wolf of obesity and diabetes ready to maul you if you look sideways at a banana. You haven’t failed as a human being because you ate that box of raisins. When you feel the inevitable urge to start restricting yourself to an ever-purer diet, remind yourself of your decision. Take a deep breath and give yourself permission to relax. While unhealthily restricting your diet can trigger disordered eating patterns, certain dietary changes can also help beat an eating disorder. Fat, in particular, is your new best friend. Fat promotes satiety, leaving you less susceptible to binging because you don’t feel restricted or deprived. A high fat breakfast can be especially helpful. Fat can also help when you’re fighting off a binge: eating a spoon full of coconut oil or a pat of butter often helps suppress the urge. Fat isn’t only helpful for binge eaters: for recovering anorexics, it can be great way to get in enough calories without that disgusting “over-stuffed” feeling of eating more than your stomach is used to handling. Since fat has more calories per ounce than protein or carbohydrates, you don’t need to eat the same physical volume of food to get enough calories. If the sensation of eating animal fat physically disgusts you, try avocados or nuts, which have a completely different texture. Besides making sure to get enough fat, many people on a very low carbohydrate diet find that increasing their carbs improves their mood and gives them more energy overall. If you have trouble with binging on carbohydrate-rich foods like bread or pasta, try increasing your intake of Paleo-friendly starches like sweet potatoes: maybe your body just does better on a higher carbohydrate diet. Macronutrients aren’t the only dietary factor that can affect eating disorders. If you have frequent urges to binge on very specific foods, track your diet for a few days to make sure you’re getting all your required daily micronutrients: sometimes, a binge is your body’s way of forcing you to get something it needs, and incorporating that element into your regular diet can help. And if you’re recovering from anorexia or orthorexia, you may want to get blood tests done: your restrictive behavior may have left you with important nutrient deficiencies. Once you know what you’re deficient in, you can adjust your diet to include higher levels of that nutrient, or take supplements as necessary (although supplements should be a fallback, not your first choice: getting nutrients from a proper diet is always preferable to taking them as pills). Dietary changes can help you cope with an eating disorder, but since unhealthy eating patterns are about food culture, not just about food, you can’t fully address them without tackling the mental aspects. The first step to this is self-reflection: what about your environment triggers (or triggered) your disordered eating patterns? Something as simple as keeping a food journal can yield surprising revelations – every time you eat, write down what you ate, what environment you ate in (in the car, at your table, at work), and how you felt at the time. You’ll start to see patterns: certain people or situations that trigger your disordered behavior. Once you start to notice the patterns, ask yourself how you can change your habits to avoid the triggers in the first place. If you always binge after a hellish day at work because you drive home past Cold Stone and you just can’t resist when you’re already upset, drive home a different way. If your coworkers spend their lunch hour counting the calories in their celery sticks, eat lunch somewhere else. If PaleoHacks triggers you into over analyzing every bite of food, read the paper instead. Stress and fatigue can be triggers in themselves, and, by wearing you down, they make every other trigger that much harder to face down: do whatever you can to cut chronic stress out of your life, and commit to eight hours of sleep every night. If you can’t get away from your triggers immediately, start making a plan for the long term. And in the meantime, focus on damage control. How can you handle the trigger in a healthier way? Some people use a mantra; try writing yourself an affirmation that you’re strong and you can deal with this. Others find it helpful to redirect their emotions into something else – a journal, a phone call to a friend, or maybe a punching bag. If the trigger creates an emotional need (to punish yourself, reward yourself, distract yourself, or anything else), fill it. But fill it with something other than food. Avoiding triggers and redirecting your responses away from food can be mind-bendingly difficult at first, but eventually your new behaviors become habitual – you learn to respond to these situations by doing something other than eating. Possibly the most valuable of all resources for dealing with an eating disorder is support. You don’t have to go this alone. Talk to anyone you feel comfortable talking to. Support from someone who loves you can make all the difference in the world, especially when the going gets tough. And it will get tough. Inevitably, you’ll stumble and have to pick yourself back up, only to stumble again. It’s a lot easier to get back up the second (and third, and tenth, and five millionth) time if you have someone to give you a hand. Even if you have the best planning and support in the world, dealing with an eating disorder is brutal. And we live surrounded by a culture that sells them from 50-foot billboards: you’re in the trenches under heavy bombardment, every minute of every day. But an eating disorder doesn’t have to ruin your life. You’ll get knocked down – that’s fine. Just don’t stay down. You’re stronger than that.